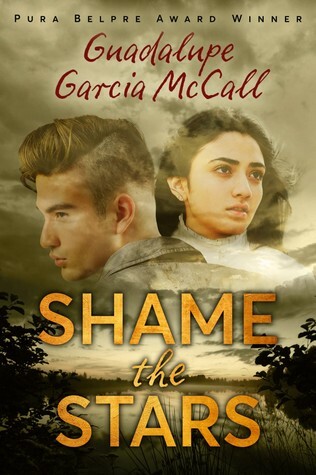 Today we welcome Guadalupe Garcia McCall to share about her most recent book Shame the Stars. I really enjoyed reading this amazing historical romance and was excited to be able to find out more about the book. Publisher’s summary: Eighteen-year-old Joaquín del Toro’s future looks bright. With his older brother in the priesthood, he’s set to inherit his family’s Texas ranch. He’s in love with Dulceña—and she’s in love with him. But it’s 1915, and trouble has been brewing along the US-Mexico border. On one side, the Mexican Revolution is taking hold; on the other, Texas Rangers fight Tejano insurgents, and ordinary citizens are caught in the middle. The Texas-Mexico border during the Mexican Revolution is an intriguing time and place for a novel. How did you come to the idea of that particular setting? I really wasn’t looking for an idea. The story’s main character, Joaquín, came to me fully fledged, wanting to tell me his story in the middle of the night. I had gone to bed upset after reading about the lynching of Mexicanos in South Texas during the matanza, the rebellion of 1915, in Dr. Johnson’s book, Revolution in Texas. My son, James, had introduced me to the book that night, and I’d stayed up late pouring over the details, looking at the horrific picture of two Texas Rangers proudly sitting on their horses with the ropes still tied around the corpses of two so-called “rebels” laying in front of them. That picture became a postcard. People bought it and sent it to their loved ones. The sadness that overwhelmed me as I thought about all the people who suffered at the hands of the Rangers and their nefarious posses overwhelmed me, and I went to bed dejected that night. At around 3 o’clock that morning, Joaquín’s voice awakened me. I could hear him talking to me, telling me his story. “Me llamo Joaquín del Toro, and I live at Rancho Las Moras,” he said, and after the third time I heard his voice, I got up, went to the bathroom, put down the toilet seat, and started writing on my notepad, because I thought it was just going to be a small thread, a small poem perhaps, something to get rid of the ghost of those horrible pictures I’d seen online of Mexicanos lynched in the chaparral. Well, it turned out to be much more than that, and five years later, the book is finally done and I’m glad I got up and listened to Joaquín. His story is important to me. His voice lives in my heart. Do you see connections between conflicts of that time and situations/events in the present? Oh, yes. Unfortunately, there is still a lot of prejudice against Hispanics in this country. The current political climate is riddled with anger and hate and intolerance. But there is a lot of support too. Thank God we have people who see us for who we really are, as hard-working, respectful citizens of this country. I became an American citizen because I love this country. I love it as much as I love my Mexico. American has shaped me as much as Mexico has shaped me, and for that reason alone I love living on the border. I am no different than most of the Mexican-Americans I know, good, honest people straddling two worlds, two languages, two loves. How did writing Shame the Stars differ from writing your previous novels? Shame the Stars didn’t take as long as Under the Mesquite took to write. I was working on that manuscript for about 10 years, but it did take longer than Summer of the Mariposas. The reason is that I didn’t have all the details when I started working on Shame the Stars. I had only read Dr. Johnson’s book once, and done some superficial digging around online. I was pretty foggy on the details, so I wrote the first draft, in verse (the original novel came to me in verse) before I lost the passion, while Joaquín’s voice was still fresh in my mind. When I was done with that first draft, over 100 pages of poetry, I did more research. As I researched, the storyline changed. The plot grew and grew, as more and more layers started revealing themselves. When I read through the archived newspapers in the Library of Congress, I found more and more of the storyline in the actual historical events surrounding the “rebellion of 1915.” I included some of those newspaper clippings in the novel, not just as evidence, but to foreshadow events in the novel and build suspense because they are so important to the storyline. I read Dr. Johnson’s book, Revolution in Texas, many, many times, making notes on the sidebars, putting sticky notes everywhere, underlining, highlighting, making sure I really understood the conflict, the history of South Texas, what led up to the “rebellion” and the actual matanza. I also went through the archives in the Library of Congress, counting myself lucky that 100 years had gone by and I had access to those newspapers online. I also went to the central library, the orange building in downtown San Antonio, and read other books that dealt with the History of Mexican-Americans in the U.S. Most of my research was done online though, from home. Every time I found something relevant, I would print it out, highlight, and write all over it. When I wasn’t at my computer, I would read on my phone. I have so many screenshots and pictures on my Samsung dealing with the matanza, I might never get rid of that phone. Everything I read, screenshot, highlighted, and marked up served a purpose, and that was to inform my writing. Not everything went into the novel, but it helped me to see the big picture, to find my bearings as I wrote about a time and place I could only imagine. How do you balance writing, presenting, teaching, and the other aspects of your life? I’m a zombie. I don’t sleep. No, seriously. It just has to do with passion. I’m as passionate about teaching as I am about writing and speaking. I love my jobs. When I was a young mother, I was all about the mothering: the bottles, the little league, the trips to the theme parks. With a soccer-mom van and a book in my hand, I dedicated myself to the boys, James, Steven, and Jason. I loved being a mom. Now, these books are my children. They are, however, more than my life. They are the other means by which I inform students. I look at writing as an extension of my classroom. The way I will keep “teaching” long after I retire from the classroom, long after I’m gone. Teaching is the gift God gave me. Writing is the vehicle. It’s a great life, and I am humbled by the gift of it every day I get to live it. How much do you share about your writing life with your students? I try not to get too excited about my own success, especially in front of my students. They need me to be their teacher, not some self-important, stuck-up famous person. Most of them know I am a writer. They google me, so I can’t ignore it either. Mostly, I share my struggles with them as an example of how even published writers have to work hard at writing. When I am teaching them to revise, I share my revision notes from my editor on the LCD projector. I show them what good writing notes to your writing partner look like (Thank you, Stacy Whitman). I show them that a good editor is honest but kind, truthful but respectful. I also show them my revisions. My computer program tracks changes in different colors, so they get to see how the original text in black changed. How I layered in the blue text during revision 1, the purple text in revision 2, the red text in revision 3, and so on. It shocks them to see how much revision work and thoughtfulness goes into writing. So when I ask them to revise a one-page essay, they are less reluctant to do the work. What’s ahead for you? Are you able to share anything you’re currently writing/revising? I’m in the process of finishing up the sequel to Shame the Stars, tentatively titled, Estrella’s Long Journey Home. It is set in Monteseco, sixteen years after the rebellion, and follows the repatriation of the del Toros into Mexico in the winter of 1931. 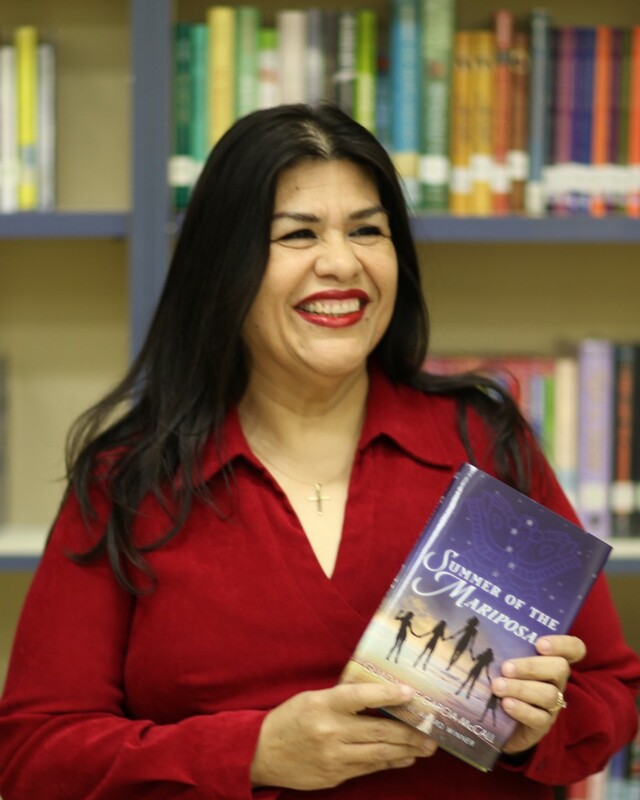 Guadalupe Garcia McCall is the award winning author of Under the Mesquite, a novel in verse, and Summer of the Mariposas. Her poetry has also appeared in many publications. McCall was born in Mexico and immigrated with her family to the U.S. at age six. She grew up in Texas and is currently a high school English teacher in San Antonio.